We recommend that you orientate yourself on your pre-pregnancy / pre-nursing size. Those leftover pregnancy pounds will be absorbed by the babywearing insert, assuming that in those early weeks baby is always in tow. To assist you in selecting the correct mamalila size for you, a size chart is available for each product in the "size" tab. Still unsure? Then simply order two sizes to sample. How warm does the babywearing jacket keep me and my baby? Of course, our products vary in the degree of warmth they offer, information on each product can be found in the product descriptions. However, you should keep in mind that thanks to baby you have a small oven inside your jacket with which you are exchanging heat. Therefore, many babywearing parents decide on a jacket that is lighter than that what they would normally wear. How should I dress my child when babywearing? In winter it is import that baby has warm padded shoes on, maybe even legwarmers to help keep their legs warm as pants often rise up while baby is sitting in the carrier. Otherwise you do not need to dress your baby very differently than you would at home. When the temperatures are low, an extra thin wool or fleece jacket makes sense. In deepest winter, maybe a wool or fleece bodysuit might be needed. And don’t forget to cover baby’s head! 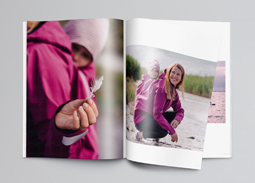 Although some of our jackets come with a hood on the babywearing insert, this should only be used as protection against rain and wind. For baby a hat will guarantee warmth, because the head and especially the ears of a baby are very sensitive. Can I also babywear on my back? And how would I then put the jacket on? Yes! Simply zip the babywearing insert into the back zipper before placing your baby on your back. 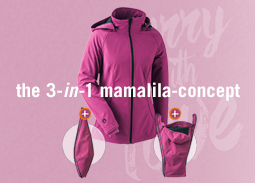 In our "How to Instructions" you will find suggestions as to how best to put the jacket on: https://www.mamalila.de/How-to-instructions. Try some of these different methods out, you are sure to find the one that is just right for you! Do you have any other questions? Then please contact us, we are happy to help.